Jaipur: The second phase of the Jaipur Foot artficial limb fitment camp for the people with disabilities began in PhuTho province and northern mountaneous area of Vietnam..This rehabilitation camp for the Vietnam war invalids and citizens has been organised jointly by the Indian ministry of external affairs and the producers of the Jaipur Foot, Bhagwan Mahaveer Viklang SahayataSamit(BMVSS)i, the Jaipur based world's largest organisation for the handicapped. 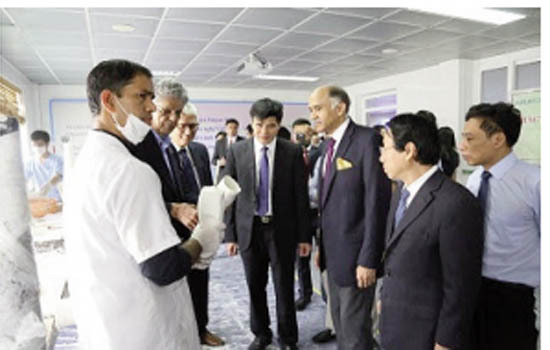 BMVSS execitive president V R Mehta said, apart from Vietnam, a simultaneous camp is being organised at Yangon in Myanmar and the camp is organised jointly by the external affairs ministry and the BMVSS under an agreement with the BMVSS as the implementing agency. Mehta said that in the eralier camp at VinhPuc 267 persons were benefitted and in the current camp 200 persons. This is a deeply meaningful social and humanitarian activity for citizens and people in the area. Furthermore, The camp is organized on the occasion of 71st anniversary of Vietnam war invalids, martyrs (27/7/1947 - 27/7/2018) when all levels of government bodies and people in PhuTho province in particular and Vietnam in general are celebrating and showing gratitude and tribute to all war invalids and martyrs. Ambassador P Harish said, that the camp has been organised in asscoation with the BMVSS under an agreement where the ministry of external affairs will hold camps in foreign countries and the beginning has been made from Vietnam. After more than a year of conducting surveys and evaluations under Vietnam Ministry of Health’s consent, PhuTho People's Committee and the BMVSS experts collaborated with the Spark Minda Group, an Indian company to select PhuTho Provincial General Hospital as a field site of the fitment camp, which may help over 200 disabled people in the mountainous area. In addition to supporting facilities, technicians, doctors and medical staff in the 20 day camp, the hospital will be responsible for organizing, monitoring and periodically follow-up checkup for the people who get prosthesis in the camp.